FTP is a standard internet protocol provided by TCP/IP used for transmitting the files from one host to another. It is mainly used for transferring the web page files from their creator to the computer that acts as a server for other computers on the internet. It is also used for downloading the files to computer from other servers. It provides the sharing of files. It is used to encourage the use of remote computers. It transfers the data more reliably and efficiently. Although transferring files from one system to another is very simple and straightforward, but sometimes it can cause problems. For example, two systems may have different file conventions. Two systems may have different ways to represent text and data. Two systems may have different directory structures. 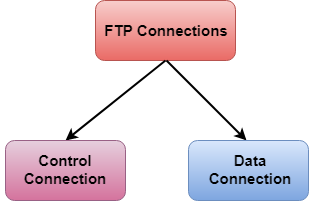 FTP protocol overcomes these problems by establishing two connections between hosts. One connection is used for data transfer, and another connection is used for the control connection. The above figure shows the basic model of the FTP. The FTP client has three components: the user interface, control process, and data transfer process. The server has two components: the server control process and the server data transfer process. Control Connection: The control connection uses very simple rules for communication. Through control connection, we can transfer a line of command or line of response at a time. The control connection is made between the control processes. The control connection remains connected during the entire interactive FTP session. Data Connection: The Data Connection uses very complex rules as data types may vary. 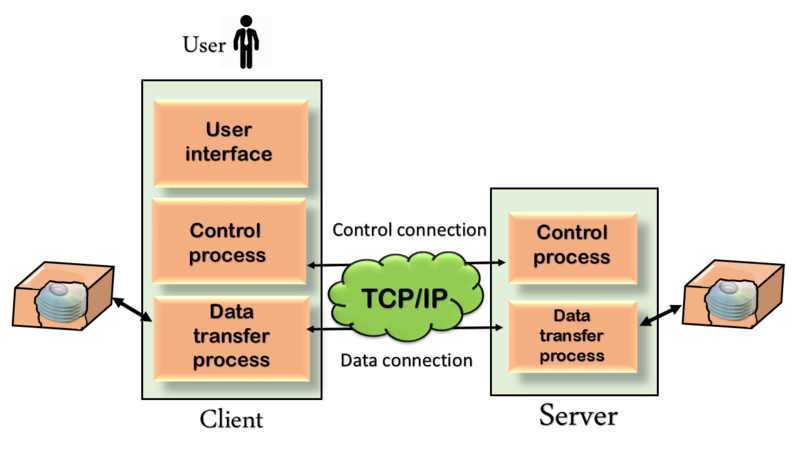 The data connection is made between data transfer processes. The data connection opens when a command comes for transferring the files and closes when the file is transferred. FTP client is a program that implements a file transfer protocol which allows you to transfer files between two hosts on the internet. It allows a user to connect to a remote host and upload or download the files. It has a set of commands that we can use to connect to a host, transfer the files between you and your host and close the connection. The FTP program is also available as a built-in component in a Web browser. This GUI based FTP client makes the file transfer very easy and also does not require to remember the FTP commands. Speed: One of the biggest advantages of FTP is speed. The FTP is one of the fastest way to transfer the files from one computer to another computer. Efficient: It is more efficient as we do not need to complete all the operations to get the entire file. Security: To access the FTP server, we need to login with the username and password. Therefore, we can say that FTP is more secure. Back & forth movement: FTP allows us to transfer the files back and forth. Suppose you are a manager of the company, you send some information to all the employees, and they all send information back on the same server. The standard requirement of the industry is that all the FTP transmissions should be encrypted. However, not all the FTP providers are equal and not all the providers offer encryption. So, we will have to look out for the FTP providers that provides encryption. FTP serves two operations, i.e., to send and receive large files on a network. However, the size limit of the file is 2GB that can be sent. It also doesn't allow you to run simultaneous transfers to multiple receivers. Passwords and file contents are sent in clear text that allows unwanted eavesdropping. So, it is quite possible that attackers can carry out the brute force attack by trying to guess the FTP password. It is not compatible with every system.